As long as you aren't offended by the color scheme, it is actually quite nice. 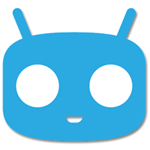 Undeniably CyanogenMod, but the ripple effect is also a trademark of Lollipop's Material Design animations. It caps off with a nice card swipe once the reboot has finished. While I like to give grief to people who get worked up about these kinds of things, it is more than just color preference. Most phones don't have any sort of auto-brightness feature while booting up, so a white background can be quite blinding if you're sitting in the dark. The CyanogenMod team had to decide whether to prioritize this or the fact that Material Design has more or less shunned dark colors, and they went with the vibrant, Lollipop look. For an alternate look, a YouTuber has uploaded a video of the boot sequence on their One Plus One. Surely there will be flashable alternatives for those of you who aren't fans. Until then, our comment section will be here for you to vent. Various boot animations can be flashed using the CyanogenMod Theme Showcase app, too.